Brighton Resort in the famed Big Cottonwood Canyon opened at 9 a.m. sharp on Tuesday, Nov. 13, marking the start of Utah's 2012/2013 ski and snowboard season. The first day brought out an excited crowd of locals skiers and riders, including a number of pro rippers like JP Walker, Seth Huot and Erin Comstock. Rose Struble and Alisa Evans, Brighton season passholders from Salt Lake City, arrived at 7:30 a.m. to claim their spot in the lift line and ensure first chair cred. "Today is a great start to the season," said Struble, who celebrated her second consecutive year of first chair status at Brighton. "It's always exciting to open with more than just one lift." With a classic Lake Effect storm pushing through Utah last weekend, Brighton received more than enough light powder to open multiple lifts, including Majestic, Snake Creek and Explorer. The three lifts provide access to soft groomers, leftover powder stashes and about a dozen park features. 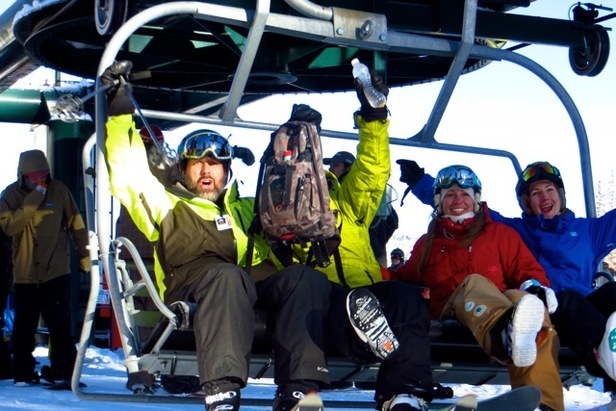 While the official trail count stands at 13 runs according to Ski Utah's website, Jared Winkler, marketing manager at Brighton, said just about everything that's accessible from the lifts is fair game. "We count anything as a trail at Brighton," he said. Brighton, which opened with a 39-inch base, will continue to add more terrain and chairlifts throughout the week. Daily adult lift tickets are running at $49, with the price increasing as more terrain opens.